Last night under the first full moon of 2018 (AND the first supermoon!) we welcomed in the New Year by saying goodbye to the one that’s just ended. Moving powerfully forward into a new year is difficult if we haven’t first allowed ourselves to fully process the one that’s passed–if we haven’t acknowledged and released the challenges and disappointments, reflected on and celebrated the victories. How can we form potent intention for change if we’re stuck inside the energy of an old way of being? 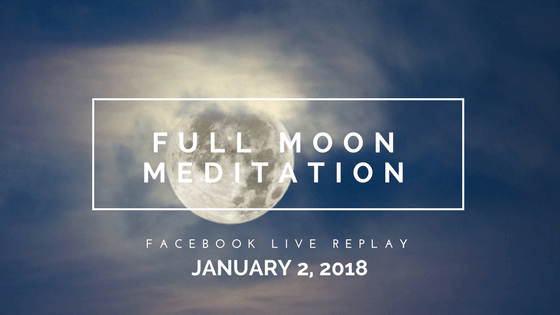 If you missed the live meditation, I invite you to join in now with the replay video. The energy of the Full Wolf Moon is still strong and the new year is still young, so get cozy and prepare to look back, give thanks, and let go of what no longer serves you…so you can step forward into 2018 with grace and strength.